APCC as a foundation contractor provides full enabling works package to all kinds of construction projects. Enabling works include shoring for deep excavations and dewatering in addition to the excavation work itself. The work may or may not include deep foundations. The main contractor will receive a ready site for construction of the basements and the superstructure. APCC provides all types of shoring works by embedded retaining walls. The type of shoring used for deep excavations is chosen based on several parameters such as the depth of excavation, water tightness of the shoring walls, surrounding areas occupancy, utility services embedded around the plot, size of the plot, cost effectiveness, local regulations and other factors. The common known types are the king post walls (steel beams with lagging, sometimes called soldier piles), contiguous piles walls (sometimes called tangent pile walls), secant pile walls, diaphragm walls and sheet pile walls. These walls may be cantilever walls depending on passive earth pressure for their stability or supported walls by internal strutting or raked beams (commonly known as rakers) or externally supported by tie back anchors or rods. The walls could receive multilayer supports depending on the excavation depth. King post walls are made by driving the I-shaped beams directly in to the soil by vibrohammers or installing them in a previously drilled borehole by a rotary drilling machine. the beams are usually spaced 1m to 2m. The wall is constructed by installing lagging between the beams during excavation. The lagging may be timber plates or posts or may be precast concrete panels. Usually king post walls are used for shallow depths unless there is enough cohesion in the retained soil. For deeper excavation, contiguous pile walls are preferred especially when the water flow can be controlled easily. 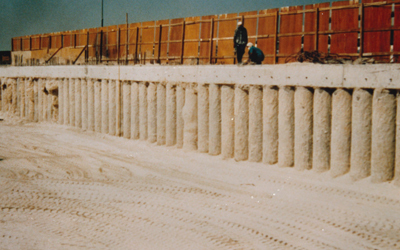 The concrete piles may be 500mm in diameter or more depending on the depth of excavation and the supporting system. The gap left between the piles may be 50mm to 150mm depending on the type of soil and water conditions. If water tightness is required, secant pile walls are used. The secant piles are usually made by overlapping secondary reinforced piles into primary unreinforced or lightly reinforced piles. The wall acts as one continuous unit. The overlap is usually between 80mm to 200mm depending on the depth of excavation. Due to the inclination tolerances that are practically unavoidable, the pile walls whether secant or contiguous have limits for the depth. Foe much deeper excavation (approximately 20m or more) diaphragm walls are better in verticality and water tightness. They also provide higher structural strength and better serviceability and may be used as part of the permanent structure as well. Diaphragm walls are reinforced concrete walls cast into rectangular holes dig by mechanical or hydraulically operated grabs or by the trench cutters known as Hydrofraise drillers. These are heavy drilling machines capable of providing deep rectangular holes. Combining these diaphragm rectangular panels will result in a continuous shoring wall. APCC with a fleet of more than 40 drilling rigs, more than 50 cranes, 3 cutters and many vibrohammers, etc., could install thousands of linear running meters of shoring walls to depths that reached in some projects to more than 35m. Our iconic projects such as OPUS, The Jewel of the Creek, ICD One Za’beel, Ocean Heights of Damac, etc., are clear examples of what we can provide our clients. The basic philosophy and strategy of APCC is based on meeting the needs of its customers by adopting a cost-effective approach and enhancing the quality of works and ensuring the best safety and enviormental requirements.